Streeter Lecka/Getty ImagesNo. 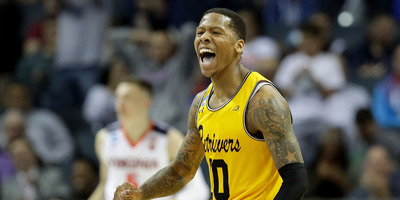 16 UMBC completed the greatest upset in college basketball history on Friday night, taking down No. 1 Virginia in the first round of the NCAA Tournament. March Madness history was made on Friday night as the No. 16 UMBC Retrievers upset the No. 1 Virginia Cavaliers. Teams seed No. 1 were a perfect 135-0 in the first round of the NCAA Tournament prior to this game. The win was the first NCAA Tournament victory in school history for UMBC and sets the Retrievers up for a second-round game against No. 9 Kansas State for a spot in the Sweet 16. March Madness history was made on Friday night as the No. 16 UMBC Retrievers became the first team to ever take down a No. 1 seed in the first round of the NCAA Tournament with their win over the Virginia Cavaliers. The win was likely the greatest bracket-buster in the history of March Madness pools – 32.9% of ESPN brackets had Virginia going on to the Final Four, more than any other team in the field of 68. Across social media, basketball fans expressed their praise, awe, and disbelief at the Retrievers unprecedented accomplishment. Oh my God. UMBC. This is going to happen. The world is going to split in half and the internet will go off line. What's most wild about this 16-seed upset is it's not even close. It's a blowout. UMBC’s win undoubtedly busted more brackets than any other game in the history of the NCAA Tournament. But it’s hard to root against an underdog, as the Retrievers proved on Friday night.